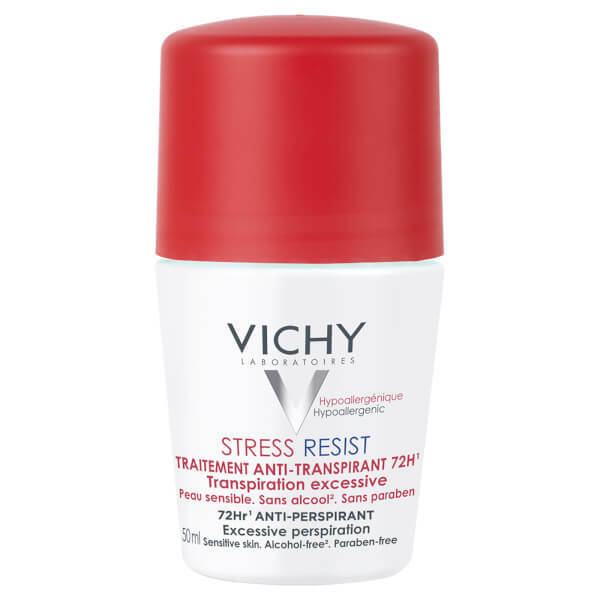 Stay fresh and protected with Vichy 72-Hour Stress Resist Anti-Perspirant Deodorant, a roll-on deodorant that delivers intensive anti-perspirant treatment for excessive sweating. Ideal for men and women experiencing intense perspiration, the ultra-tolerant, hyper-effective deodorant is rich in anti-perspirant active ingredients, ultra-absorbent minerals and Perspicalm™, and helps to regulate heat and perspiration during times of stress. Combines super-effective anti-perspirant properties with ultra-tolerance for the skin. Keeps you feeling fresh, confident and protected. Free from alcohol and parabens. Tested on 100% sensitive skin. Aqua / Water, Aluminum Chlorohydrate, Dimethicone, Aluminum Sesquichlorohydrate, C14-22 Alcohols, Steareth-100/Peg-136/Hdi Copolymer, Parfum / Fragrance, Perlite, C12-20 Alkyl Glucoside, Iodopropynyl Butylcarbamate, Rosa Gallica Extract / Rosa Gallica Flower Extract.